I was really excited about a true farm sanctuary pig story for children. (They are so few and far between considering how many amazing farm animal biographies are out there.) There are some really great farm animal biographies geared for adults (Ninety-Five and Farm Sanctuary) and a lovely collection of poetic bios for children (Our Farm) but not nearly enough in my opinion, especially at the rate our family reads through books. 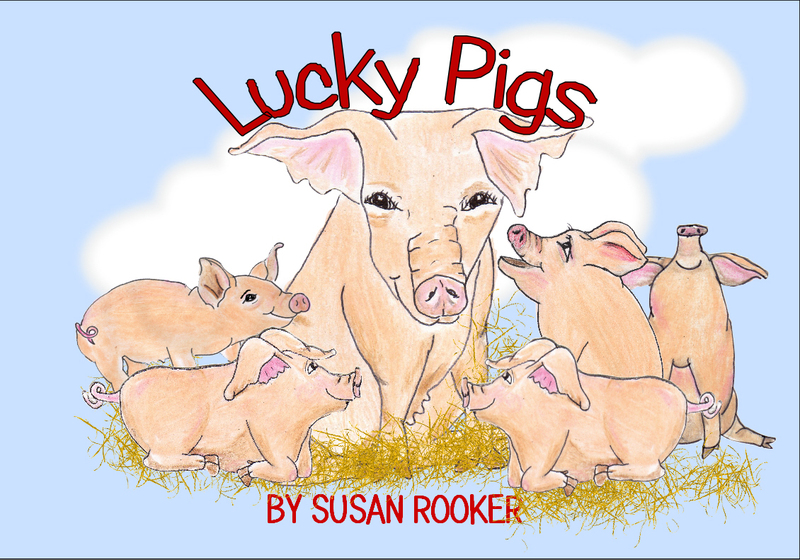 In this story, Nikki, a mother pig, relates her rescue for a well-loved, familiar bedtime story to her piglets Freston, Rory, Ellen, Portia, and Chuck. With much interruption, the piglets actually tell most of the story with Nikki’s confirmations. The pigs describe factory farm-like conditions supplemented with a child-friendly sketch of a pig in a gestation crate, a flood which released the pigs from the factory conditions, Nikki’s arrival on a levee where she gave birth, and the arrival of the pig rescuers. The story is one of many true amazing pig survival stories from the 2008 Midwest Flood Pig Rescue. A little photo of Nikki and her piglets and a brief bio is included at the end of the book. Although I love the concept of Lucky Pigs, I felt the execution left a lot to be desired. The juggled dialogue/narration between the 6 pigs distracted from the story. While having the piglets tell the story can be appealing to young children and anthropomorphising the piglets to sound like excited, talkative children can help a large human family relate to the rescued pig family, I felt the narration became choppy and a little confusing, especially for a child. Also the style of writing and illustration was inconsistent, with a couple pages of forced rhymes at the end of the story and illustrations that were sometimes painterly, sometimes sketchily hand-drawn, sometimes cut-out and collaged, and sometimes clearly Photoshopped or unattractively pixelated and stretched. I did feel that the use of black and white to retell the past is useful in helping children with the flashbacks. I wish the author had picked a single style of writing- either prose or rhyme- and a single style of illustration (the painterly image on the first and third to last pages are lovely) to help with the cohesiveness of the story. Although I was disappointed by the execution, it is nevertheless a new, true pigtale to share with children.